Bom Dia from Portugal this time! We are at our second stop of our one-month vacation in Europe. For two weeks, we are staying in a coastal town near Lisbon. The beach is 100m away from our holiday home. We are surrounded by tiny restaurants, off the beaten track, that serve freshly grilled sardines and chicken. Fruit an vegetables available int he grocery stores are mostly local produce. For me, after having lived in Dubai for 8 years where local produce is scarce, this is amazing. I go for long slow runs along the coast at least every other day. The wind blowing from the Atlantic is a reliable refreshment on those runs. I go past cliffs and light towers. Probably the most scenic runs I have ever done. And in the evenings, without fail, we watch Olympics. To me, it's a must. Being in the same time zone as the Olympics in London makes it very easy and convenient. Since my childhood, I have always followed the athletics and swimming the most. But I also like the Olympics because I get to see other sports that are otherwise not as present on TV, such as archery. With such a busy holiday schedule, you might suspect that I haven't cooked much. I'l be honest: I haven't cooked at all. I am not even missing it. As we are watching the Olympics for yet another night, I have a platter of veggie sticks, olives, local cheeses and smoked ham and melon in front me. Plus a bottle of wine. What else does one need? 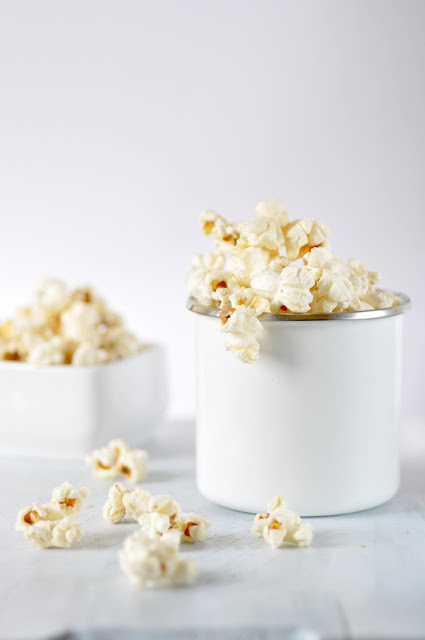 But I take the opportunity and leave you with the recipe of our regular TV sport food back at home: homemade butter popcorn. Kids and husbands love it, and as we are quite an active TV sports family, popcorn needs to be dished up on a regular basis. Popcorn is the easiest thing to make. It only needs popcorn kernels, butter and some salt. And a heavy-bottomed pot. This is the most important utensil here, as it reduces the risk of burnt popcorn to a minimum. With the house filled with the smell of melted butter, and a happy family on the sofa watching TV and eating a healthy snack, life can be good. Enjoy! In a heavy-bottomed pot, melt butter slowly over medium heat. Add the corn and shake the pot so the corn gets evenly coated with the melted butter. Cover with glass lid (so you can see what's happening inside) and cook over medium-low heat. Occasionally shake the whole pot with the lid on, until corn is starting to pop. Leave the heat on, as long as you hear many pops. Once the popping slows down, switch off the heat. Leave the lid on for another half minute or so, or until there is no more popping sounds. Season with sea salt and transfer to serving bowls.